Thursday December 14th 1893 I ironed, baked bread, and got lamps cleaned besides dressing chicken and getting a good dinner. Leonard was splitting wood and Will put it in the barn. In the afternoon I did some cleaning and changing things about the house. Wrote a couple of notes and went up town before supper. It was drizzling rain. Mrs Bivens spent the evening down stairs with me. Friday December 15th 1893 It was raining this morning and we did not get up early. I hurried around with my work. Fanny and Annabel came and the boys were here for dinner. Edith helped me. Hattie stopped on her way home from Mr Bradleys funeral to take the girls home. It was a dark misty day. I knit some and wrote most of the evening. 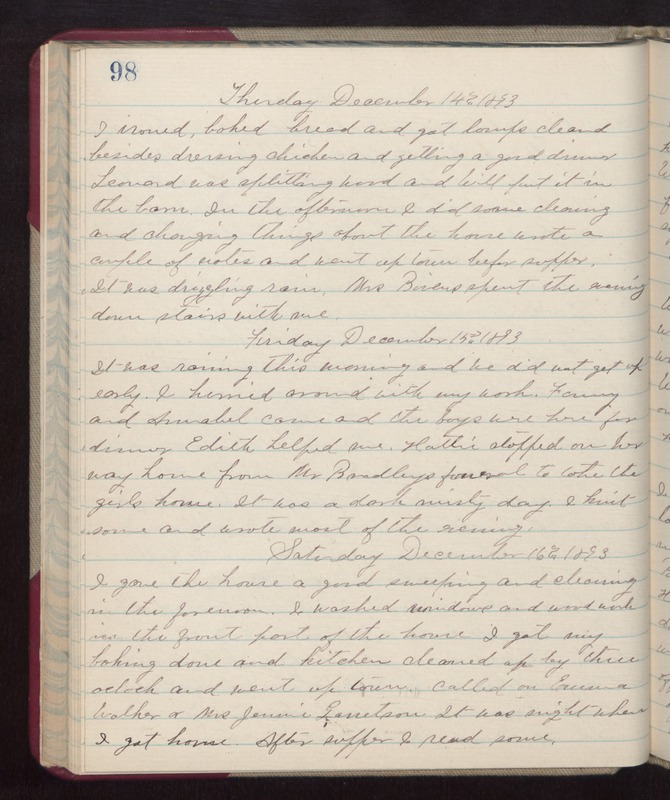 Saturday December 16th 1893 I gave the house a good sweeping and cleaning in the forenoon. I washed windows and wood work in the front part of the house. I got my baking done and kitchen cleaned up by three oclock and went up town. called on Emma Walker & Mrs Jennie Garretson. It was night when I got home. After supper I read some.